Call of Duty: Black Ops 4 missing a single-player campaign doesn't slow sales, becomes top-seller of October 2018 against hot competition. New figures from NPD reveal surprising stats for the latest COD title. With the release of Call of Duty: Black Ops 4 last month, the developers took a risk as it became the first game in the series not to feature a traditional single-player campaign. This decision divided the community, and many were not going to purchase the game. However, with the lack of a campaign there was the highly anticipated new Battle Royale Mode, "Blackout" which would see 40 vs 40 battles take place on a large open map with iconic places from COD history. This mode alone proved to be a big selling point for the game and many enjoyed Treyarch's take on the Battle Royale genre. Despite criticism surrounding the title, the community has proved loyal to the series once again. 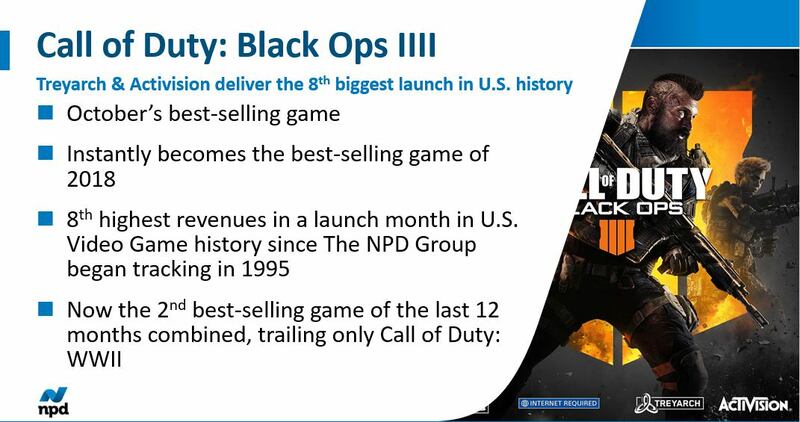 Thanks to a new report from the NPD group, we can see that Call of Duty: Black Ops 4 was not only a massive seller for the franchise, but was also the top-seller of October, beating out competition from games such as Assassin's Creed Odyssey and even the titan Red Dead Redemption 2 (which launched at the end of the month). And the COD community is already making the most of the game, with the brand new Battle Royale Mode Blackout being a standout for many people. If you'd like to get your hands on Black Ops 4, you can save 20% off this week as part of our Black Friday deals!